Much of Ricardo Sánchez's poetry lashes out at a society he believes is bent on crushing his culture, his realities, his very existence. But where most readers see anger, Maya Angelou sees love. “You have to love somebody or love a thing to really articulate your disappointment, ...If you didn't love it, you couldn't be that angry with it,” says Angelou, a longtime friend of Sánchez, the El Paso poet who died Sept. 3. El Paso will focus on the work of Sánchez who grew up in the city's El Barrio del Diablo, in this weekend's Border Voices '95 celebration at the University of Texas at El Paso and the civic center. Angelou, a professor of American studies at WakeForestUniversity in Winston Salem, N.C., recently shared her views of Sánchez's legacy during a phone interview from her home. Question: When did you first become familiar with Sánchez's work? Answer: I was in San Antonio, I can't tell you exactly when, but I know Henry Cisneros was mayor. (Sánchez) had a column in the newspaper, and it just blew me away. I was amused and amazed and stimulated by it. So I bought a book and again, it just so delighted me. He was so strong and forceful. His voice was so evident in his work. So I went to meet him. I introduced myself, and he knew my work, so we just became friends, immediately, and agreed to be brotherly and sisterly with each other. Q: What were the primary themes that struck you in his work? A: His love of himself. That is, not himself, Ricardo, but himself the Mexican, the Spanish-speaking; the Latino, himself, the Pachuco. He loved being who he was and coming from the family he came from, and the community he came from. Q: Did his poetry give you insight as a non-Chicano into what it means to be a Chicano? A: Absolutely. Absolutely. Also, I learned through his poetry the invasion of the Anglo world into the Chicano world – the unwelcome invasion. That is, the presence of prejudice and ignorance in the Chicano world. He never, as we know went gently. Q: Did his poetry allow you to draw connections between what it is to be a Chicano and what it is to be an African-American or a woman? A: I feel those connections when I read anybody, anybody good. ... I see through his poetry that human beings are more alike than we are unalike. Q: Do you consider Sánchez to be among the premiere post-war American poets? Q: More than just one of the best Chicano poets? A: You see, being a Chicano was what he was born into. But being a poet was what he was born to be. He would have been a poet if he had been a cowboy on the Brazos. He would have been a poet if he had been a Bostonian. He was born to be a poet. Q: Do you feel the genre of Chicano literature has been properly recognized? A: Ignorance largely, Chicano poetry has not been marketed, and I don't mean just in the commercial way. What I've learned is that power has never been known to give up any of itself on a simple request of it. The Chicano poets have to thrust themselves more aggressively, not just into the larger world of media, but in the Chicano community. Because quite often people recognize poetry but they don't know that's what they're recognizing. That is to say, they love what they hear but they don't realize that that's poetry. And by the means of poetry they stay alive and survive and thrive. Q: If someone were to ask you, “Why should I read Ricardo Sánchez,” what would you say? A: I would say for enjoyment fist and then to learn more about one's own self. I would never say read Ricardo because you'll know more about what it's like to be a Chicano. First the enjoyment, because he was and dared to love. ...Then the reader, her second sensation will be personal, and she will think ponder, consider herself, “I wonder, would I feel that way?" or “Yes I felt that way.” I think that the encouragement for the reader is to read Sánchez and enjoy yourself. A: Isn't Sánchez's work most noted for the anger he expressed, particularly toward the dominant society? A: That anger comes from love. You have to love somebody or love a thing to really articulate your disappointment. ...If you didn't love it, you couldn't be that angry with it. You love the potential, you love what you know it could be, and should be and must be. Otherwise you can't get really angry. You ignore it if you don't really care for it. Q: Do you think 200 years from now, your successors as professors of literature will be teaching Sánchez's work? A: Oh, absolutely, and it won't be 200 years from now. Poets go in an out of fashion, just as do musicians, composers, sculptors, actors and so forth. So after death, there's a mad rush for Edgar Allen Poe or William Blake. People go in fashion and then they go out again, and then something happens and suddenly James Baldwin is popular again, and taught again. But nothing is lost. It's not lost. This is the main thing to remember, that when a poet dies, he is not lost. That work is there. And sooner or later that work will come up again, it will rise in a pendulemic kind of way, and people will see it and study it and argue it and recite it. And then it will go away, somebody else will come up. I could and did weep at the passing of Ricardo, but Ricardo will never be gone. His work is here. El Paso virtually has a second Chamber of Commerce. The newcomer is now four days old, sturdily built and in thriving condition. It was born last Wednesday night at Weston's Sanitary bakery, where the business men of the Five Points neighborhood had met to form such an organization. The new organization was officially named the Five Points Business Men's association. George W. Weston was appointed temporary chairman. In effect the association is a second El Paso Chamber of Commerce, the avowed purpose of which is to make known to all the central portion of the city that there is in their midst a group of up to date business undertakings which warrant trading there, thus elimination time and carfare spent in making down-town purchases. The Five Points Business Men's association will boost El Paso at every opportunity and continue a campaign in the central portion of the city to let residents know what they have in a business line and the benefits of trading there. At Wednesday night's meeting a committee composed of R.P. Holmes, T.E. Head and L.A. Lee, were appointed to draft by-laws and a constitution for the organization. R.P. Holmes, chairman of the committee, stated Saturday that the committee had drafted and revised by-laws and a constitution according to the instructions of the association and believed that they would be adopted by the organization with but slight changes. While members of the committee believe it best not to make public the provisions as drafted until after the meeting of the association next Wednesday night, it is known that they provide that after their adoption, any citizen in the Five Points neighborhood, who is interested in promoting the best interest of that community, may become a member. It was said by remembers who attended he organization meeting that a membership campaign might be carried on later, although it appeared from manifestations of those in the vicinity who had heard of the project, that but little work would be necessary to secure the co-operation of many residents having homes and interests there. Merchants and property owners present at the meeting were J.E. Maloney, A. Maloney, L.A. Lee, R.P. Holmes, I. Jacobson. W.W. Bryan, T.E. Head, J.L. Ballantine, H. Brucker, E.L.W. Polk, George W. Weston, Manuel Aragon, George D. Kendall and several others. The name "Five Points" was favored because the location of the places of business are at a point where Montana street, Elm Street, Piedras street and East Boulevard all meet. "I have believed for some time that this must come," said T.E. Head Saturday, speaking of the meeting Wednesday night. The location of "Five Points" is as near the center of El Paso as it is possible to locate a center. It is surrounded by the most thriving residence section of the city. There is such a meeting of highways and intersection of street railway and jitne systems that it must necessarily follow that more people pass this location than any other spot in El Paso, with the exception of the busiest down-town district. "Undoubtedly considerable good will be accomplished by the body organized," stated Mr. Head Saturday. "Primarily the merchants intend to show the people who reside around Five Points that they can secure almost everything they need very near their homes. There will be an organized effort on the part of the merchants to keep prices down to a point fully as low as is offered down town and to carry in stock, in their respective lines, everything that even the most exacting customer may demand. "The growth of this neighborhood had been wonderful. It has surpassed the expectations of the most enthusiastic boosters, of whom I have been one. In 1915 there was but little investment at what is now 'Five Points.' Practically all the development has been made since 1916. If you will take the growth during the last 16 months and imagine it continued for even a period of 24 months, it will be seen that within that time nearly one-third of the population of El Paso will be within walking distance of this location. At least that is my calculation, and my estimates on growth in this neighborhood have heretofore fallen short." R.P. Holmes, chairman of the by-laws committee, stated Saturday that the outlook to accomplish the objects of the association were exceedingly favorable. "There has been a jump in business here at Five Points within the last nine months that cannot rightly be characterized as anything less than a full-fledged boom. We have three drug stores, five groceries, two meat markets, a restaurant, tailor shop, one of the biggest dyeing and cleaning houses in the city, two garages, a dry goods store and two oil filling stations. "We meet again next Wednesday night to elect permanent officers and pass on the constitution and by-laws. After that I predict that things will move some along the lines laid out by the association." Most of the merchants of Five Points, in interviews Saturday, called attention to the fact that eight paved thoroughfares lead to the place; that street cars go through Five Points to Manhattan Heights, Grand View, Government Hill, Austin Terrace and to Fort Bliss; that jitne cars via East Boulevard, Montana and Fort Bliss also take thousands of people daily through Five Points. Many called attention to the fact that it is just about a 90-minute ride in any direction from Five Points to the outskirts of the city. "It is our objet to give to people who live here, better service than they can get down town," said L.A. Lee of the Ideal pharmacy. "That means that we shall endeavor to keep prices on a level with those of down town merchants and thereby save the people around us loss of time and street car fare or gasoline. Long before there were trading posts here, many of the citizens living around Five Points formed the habit of trading down town. People are apt to continue old habits, even when a change may be better, unless the matter of change is forcibly brought to their notice. The object of our association is to show the people what we have in the many excellent establishments here." A. Maloney of the Piedras grocery and market spoke along the same line, adding: "But very few citizens of El Paso realize what a great number of people go through Five Points every day. It is truly the center of the city. Persons going to and from FortBliss pass here. People from Grand View, ManhattanHeights, Government Hill and other points go through here on their way down town or in going to the Union station. "Business has grown here so that many passing through have been induced to stop. Yet the majority do not know what we have and they go through on the cars or spinning along in autos without making us a visit. We intend that they shall know what kind of territory they are passing through and shall be shown that nine times out of ten they can get what they are going after in the way of merchandise without proceeding farther." George W. Weston of Weston's Sanitary bakery called attention to the recent heavy investments made by incoming merchants who have seen the necessity of handling goods equal to the best. "The movement which has crystallized into the Five Points Merchants' association has been fast developing for several months. So rapidly has it progressed that many of us began to notice that our neighbors were doing the same thing-making big investments, adding improvements and making efforts to show the many surrounding residents the advantages of trading in Five Points. As we were all working along practically the same line, it appeared that common interest demanded that we work together that we may sooner accomplish our common object." Like the majority of Five Points merchants, I. Jacobson stated Saturday that he had been in business but a short time-six weeks-but was enjoying an increasing trade. "The general appearance of the neighborhood attracted me," he said. "It is a good residence section and it seemed to me that if the people were offered the same as they get down town at the same price, that they would trade here and save time and money. On that theory I put in a stock of merchandise and find that for the most part my judgment was good. Of course, I have had calls for many things not in stock and those things I have sent for. It will be part of the work of the association we have formed, as I take it, to more fully ascertain what the people wish and supply their wants." J.L. Ballantine of the Owl Drug store, H. Brucker, tailor, and Manuel Aragon are among those who have backed their judgment by making investments in Five Points, now enjoying a thriving and growing business. It is the belief of these men that within a few months lines of business other than those now in operation, and for which there is a growing demand, will be instituted by men who have been looking over the ground. W.W. Bryan of Quality Market No. 2, formerly of San Jose, Cal., opened his place of business at Five Points on July 15, 1917. In less than a month the business was on a paying basis and Monday Mr. Bryan will put on another man. "I think by Christmas that I shall have put on two men. I didn't see how the location could fail. It is better than I thought and after we have made a united effort to show the people who live all around us the advantage of trading at home, I am of the opinion that all business interest of Five Points will enjoy another substantial increase." Mr. Bryan is a finished cutter, having first been engaged in Boston. His subsequent experience in the west has made him efficient from cow-punching to cutting a porterhouse steak. Nor will the efforts of the association be confined to the matter of making known to those in the neighborhood what is to be found near them. General assistance in all matters for the general good will be taken up, say the promoters. As yet these phases have taken no definite form, but it is understood that the matter of additional police protection and improvement of adjacent parks may be taken up at an early date. His limbs shattered and broken by flying brick and mortar, wounded several times by the pistols of a dozen or more officers unable to rise to his knees because of injuries, Felipe Alvarez was shot to death in the door of the outhouse in which he had taken refuge at 2:45 o'clock this morning. Besides the shattering brick building, the doors of which were locked and one side of which was torn down by the fourth charge of dynamite hurled at the structure, his body lay riddled with bullets from a final fusillade fired by officers from every direction, when he crawled from the ruined building, his piston in his hand. He was shooting until a final ball penetrated his head, and he fell groaning to the ground. Three charges of dynamite placed under the building earlier in the morning had failed to bring the murderer outside. On the first two charges he had remained in his hiding place. When the third, and heaviest charge was directed against the small outhouse, he failed again to appear. Officers and provost guardsmen approached the building. Alvarez suddenly appeared in the door and fired four times. A civilian armed with a shotgun stood almost in front of the door. the ball passed by his head and before he or his companions could return the Mexican's fire, Alvarez had again disappeared inside the building. Officers on the roof east of the outhouse signaled the men below to withdraw, and arranged the fourth charge of explosive. This they hurled directly on the roof of the building. It burst with such shock that buildings in the neighborhood shook and several windows were shattered. The north wall of the outhouse tottered outward, and Alvarez came crawling into the areaway. Beside the shattered outhouse, on the west side and in front of the door was the body of Juan M. Garcia, an employe of the city tax collector's office. He had followed Alvarez to the door of the building when the earliest engagement occurred before midnight, shooting as he went. His body was covered with brick dust and mortar, but was not mangled by the shock of the explosion. Officers who had been near him when he fell, but who did not know his identity until after Alvarez had been killed, had seen him fall. "The blankety-blank got me right through the guts," Garcia called as he dropped to the ground. The bullet had penetrated his abdomen, and death had followed soon. Papers on his body served to identify him. Alvarez, who had murdered two small children and wounded their mother earlier in the evening, remained barricaded in the outhouse from 11:30 o'clock, when he was trapped by officers, until the final charge of explosive had been thrown. From time to time during the first hour and one-half he would appear at one of the small air vents or at the door, shooting if an officer was in view. For the final hour and one-half, however, he remained absolutely quiet. At 11:30 last night Alvarez invaded the home of Mrs. Trinidad Lucero, 615 Texas street, and shot the woman thought the head as she was standing with her young son, Alfredo Cantan, aged two, in her arms. The child was instantly killed, two bullets from the murderer's pistol passing through his little head. A second child, Salvador Cantans, aged three, was likewise shot down and killed as he clung to his mother' skirts. Mrs. Lucero's daughter Martha, aged 16, telephoned to the police. The mother, badly wounded, was able to tell the officers the name and address of the murderer, and officers were hurriedly dispatched to South El Paso. The woman was removed to the emergency hospital, where she was attended by Dr. Lynch. At an early hour this morning the doctor held out hope of her recovery. Police Captain S. H. Vester and officers were called to the woman's home following the murder. Here they discovered from the woman where Alvarez lived. They returned to the police station, and officers Charles Wood, Ed Loper and L. G. Robey were sent to the A B C Alley to locate the Mexican. Wood and Robey went to the front door of Alvarez' home. Loper went to the rear, and was standing almost at the door when Alvarez rushed from the building. Loper pulled his gun to shoot. Alvarez had his pistol in his hand. Loper's gun snapped as the hammer fell on an empty chamber or poor cartridge. Alvarez pulled his trigger once, and the gun snapped. He backed off, fired again, and the ball pierced Loepr's coat, penetrated his trouser and brazed hardship. Loper took cover in a doorway. Wood and Robey ran through the building and joined Loper. From their cover the three officers engaged the Mexican, who in the meantime had safely reached the protection of the small brick structure. Robey and Wood each fired three rounds of cartridges. Loper fired two rounds before his supply gave out. Garcia came to their assistance and started single-handed to take Alvarez from the building. He was shot at the entrance, as he attempted to swing around the door an take the Mexican by surprise. Meantime J.E. Upton heard the shooting, and summoned aid. A large force of police reserves and provost guardsmen rushed in automobiles to the scene. Drivers for one of the rent stands placed their cars at the disposal of the police to rush reserves to the scene. In fifteen minutes the entire block had been surrounded by a cordon of officers, members of the sheriff's force, soldiers, provost officers, civilians. All were armed. Rifles, shotguns and pistols barred Alvarez's escape from the small outhouse. From the Santa Fe street side of the block Andy Shobe, J.E. Upton, Bill Stewart, and O. Perea, all officers, climbed to the roofs of adobe buildings overlooking the areaway in which the outhouse was located. They crawled to the edge of the roof. Their head and shoulders showed, and they peered into to court in an effort to locate Alvarez. Perea took from his pocket a flashlight. He held it in his left hand, and in his right had he held his pistol. He leaned forward and flashed it's light on the outhouse. Alvarez' small caliber pistol barked on time with a sharp report. Perea did not speak. His pistol and flashlight fell to the ground below. His head dropped over the edge of the roof. The ball had penetrated his head, entering at the left temple and coming out at the rear. Death was instantaneous. Meantime automobiles had been procured. Four alleyways led into the areaway where Alvarez had sought safety. One automobile was placed in each o f these alleyways, and shoved forward until the light shone on the outhouse. The light from the automobile was turned down the alleyways, but it was impossible to locate the Mexican with them. Guards were stationed at every possible point of vantage, residents of the entire block were ordered from their homes, the doors of each building were guarded, and Captain S.H. Vester sent for dynamite with which to dive out the refugee. Alvarez lived with his wife and four small children in of the small adobes facing A B C alley. When his body was viewed by Coroner James M. Deaver he was found to have two cartridge belts strapped about his waist. Each was almost filled with cartridges. Coroner Deaver viewed also the bodies of Garcia, Perea, and the two small children. According to Mrs. Lucero's daughter Martha, a 16-year-old girl employed at the Elite, the family had known Alvarez for about nine years. Early last night he visited the Lucero home, apparently under the influence of liquor. He was speedily sent away, and the family was preparing to retire for the night, when the man, pistol in hand, burst into the room. He immediately opened fire, shooting little Alfredo in his mother's arms and Salvador while the latter was clinging to the other's skirts. Both of the children were shot twice. Policeman Perea, the third victim of the murderer's bullet, was a resident of Stormville on the mesa. His body was taken to McBean, Simmons & Hartford's morgue. Move over men, and let women sit in those jury boxes. That's the battle cry of an El Paso housewife, Mrs. William Tolle of 3600 Fillmore street, who has just started a one-woman campaign to change Texas Law to let women serve on juries. She is circulating a petition asking that the legislature do right by the women jurors at the next session. It will be submitted to El Paso legislators and State Senator-elect Rutherford of Odessa. Mrs. Tolle got Mr. Rutherford's signature on her petition. She also got signatures from numerous delegates to the Texas State Sheriffs' Assn. convention. "I believe women not only should be permitted but should be required to serve on juries," Mrs. Tolle said. "I didn't know they couldn't be on juries in Texas until the other day. Then I read that a woman had been summoned for jury duty by mistake but wouldn't be allowed to serve. That roused me up. "I went to see Justice Ward of the County Court at Law. He said he had seen cases that needed women jurors." Mrs. Tolle has two sons, Bruce, 10, and Floyd, 5. Little Floyd tags along as she seeks out and button-holes perspective signers. "I work at it when I'm not doing housework," she remarked. Her husband is an electronics instructor at Ft. Bliss. "He agrees with me about women jurors," Mrs. Tolle said. "But he isn't active in the campaign." At the Poki Roni Ranch, in the Kirchner family since 1929, pony rides are a hit during parties. Brooke Munkres (left) and Pat Kirchner saddle up a pony for a kids ride. Chickens cluck as their chicks are nearly trampled by prancing horses and pecked by peacocks. A pig named Oliver rolls in the sand while two turkeys strut nearby. A gang of eight mixed-breed dogs inquisitively patrols the premises. But the sights and sounds of farm life at Poki Roni Horse Farm compete with the traffic speeding along Lee Trevino 10 feet away. A lot of the peaceful charm at the stables, 8409 Bowers, was lost when Lee Trevino was extended from Interstate 10 through the Lower Valley four years ago. But even the street noise hasn’t changed what goes on at the stables. 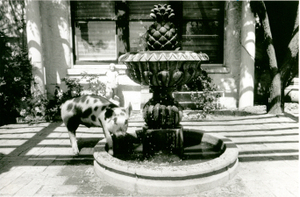 The farm dates back to the turn of the century. The Poki Roni name, however, did not come until the 1950s. During the Depression, Christine Bowers, grandmother of current owner Travis Kirchner, was in danger of losing the farm. But then the Radford School for Girls asked Bowers to give students riding lessons. The family later adopted the name Poki Roni for the business. Pat Kirchner’s son, Travis, now oversees the stables. The stables keep 52 horses, including 20 whose owners pay $100 a month to board each horse. 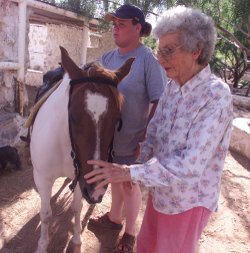 Part of the business still includes giving riding lessons to people age 7 and older. “We start out with the very basic principles – from touching and approaching the horse to putting on the saddle and bridle and cleaning the hooves. We use the most gentle horses we’ve got for these lessons,” Travis Kirchner said. He offers beginning, intermediate and advanced lessons. Advanced students compete throughout the nation. Riding lessons cost $8 for two hours. Horses for children can be rented at $5 for half an hour. The entire stable can be rented for birthday parties, at $8 per child, and the children get to compete in a rodeo in which prizes are awarded. You probably know about the accomplishments of UTEP's 1966 championship basketball team but you may not know about Charles Brown. He strolled quietly, unobtrusively through the campus ... pointing out where a class or a building used to be 40 years ago. Today's students scurry from class to class, scarcely noticing the man. He is older now, settling in at 63 for the moment. The beard is more salt than pepper. But he is still lean and he moves with the grace and dignity that, to the trained eye, are dead giveaways that he was once a talented athlete. But Charles Brown was much more than just a talented athlete. The man is far too complex for such a one-dimensional label. But, make no mistake, Charlie Brown could play some basketball. From 1956 until his graduation in 1959, Brown led Texas Western in scoring and rebounding. He also led the old Border Conference, a league with Arizona and Arizona State and Texas Tech, to name a few. He still ranks 12th on UTEP's all-time scoring list with 1,170 points. He ranks fourth all-time among those who played three years or less - trailing only such Miner luminaries as Antoine Gillespie, Nate Archibald and Jim Barnes. Oh, he could really play, said UTEP coach Don Haskins, who saw Brown play for the Miners when Haskins was still a high school coach in west Texas. He was a great player; an exciting player. And he could jump three feet off the floor. Arkansas coach and former UTEP player Nolan Richardson remembers: He was my idol. During those days, there weren't any black players we could go see on that level. So I went to see him every chance I got. Despite such an impressive athletic resume, it is something else that sets Charles Brown apart. He was the first black athlete at UTEP. He was also the first in a major sport at a major university in Texas and the first in the states that made up the old Confederacy. Charles Brown has come back to UTEP for homecoming, some 40 years since he enrolled at Texas Western. He was not the first black student at Texas Western. Thelma White owns that honor, enrolling in September of 1955. But Brown was the first athlete and obviously the most visible. Memories, memories, memories, said Brown, smiling and looking around the campus. They say history repeats itself. Well, it certainly does in your mind. Brown walked into old Holiday Hall, just behind Kidd Field. He studied the place from top to bottom. There is still a gym floor, but no longer any baskets. This is where we practiced, he said, smiling. Holiday Hall. But it was no holiday when you walked in here. I'm sore already, just thinking about it. Brown walked outside and looked at Kidd Field. Spent a lot of time running up and down the stadium and around the track, he said, shaking his head. Brown moved away from El Paso a couple of years after finishing his playing career. While he was widely accepted on the Texas Western campus, he was still a black man living in a southern state when he left the campus. He was unable to get very far into the coaching profession in El Paso, so he moved to San Francisco. This is a man who received his bachelor's degree in education from UTEP in three years. He got a Master's degree from San Francisco State. He also picked up a two-year computer degree from the University of California-Berkeley. He is retired now, but he spent more than 20 years as a top-level administrator in the San Francisco Public School System. Still, 40 years ago, Brown was a barrier breaker. Most young people think this is something that happened back around the Civil War. But it happened in Charles Brown's lifetime. It happened to Charles Brown. I was not allowed to live in the dormitories at that time, he said. I came here with my nephew Cecil Brown. We got a room near the campus. But George McCarty got us a dorm room, a place we could study after practice. We just didn't sleep there much. McCarty, now retired in Albuquerque, said, We tried to work things out. I didn't do that much. I was just trying to have a good basketball team and Charlie was a good player. He was a good player and a good citizen. If anything really bothers me, it's that George McCarty doesn't get the credit for moving forward in this area, Brown said. I had his support - not only in public, but in private. One doesn't always follow the other. Brown laughs about a story he heard recently, about a team meeting McCarty called before he reached the campus. Long-time Irvin High coach Alvis Glidewell (now retired) said, That's been more than a day or two ago. I think Coach McCarty told us he was bringing Charlie in and about the only comment was something like `is he a player or can he play or can he shoot. Charlie is just an amazing person. He seemed to fit in from the first day he arrived. Brown continued strolling through the campus, so much of it that was just dirt and rocks and mountain when he first came here. He remembered good times on campus. Away? Another story. I never had a problem with my teammates, Brown said. I was accepted right away. Alvis Glidewell met me in June and we used to come here to Holiday Hall and shoot baskets every day. One day, Alvis told me he would treat me to a movie after we finished. He went up and bought the tickets, but they wouldn't let me in. So we just left. I never tried to go to another movie while I was here. You've got to realize that El Paso was still a southern city, Brown said. It was much like the rest of the south, yet it was really probably much better than most. It was, obviously, much more difficult when the Miners played out of town. And, he was the only target. There was pressure, he admitted. It was a lot of pressure. The pressure became greater every year. It should have been the opposite. But it wasn't. The racial taunts were always difficult to contend with and Brown remembers Texas Tech as being the worst. But, he not only survived. He flourished. McCarty was quoted in the El Paso Times back in 1958: I don't mind telling you that Brown is the most popular athlete here in any sport. El Pasoan Henry Jurado remembers: He was so popular in school, such a very likable person. He was such a great player, but it was his personality that made it where he could fit in anywhere he went. Brown continues to stroll the campus, to enjoy the beautiful autumn day, to relish the memories - good and bad. Forty years is a long time and perspective gets fogged over such a span. But to clarify, Jerry LeVias played football for SMU in 1966 - the first black scholarship athlete in the Southwest Conference. Nat Worthington played football for Kentucky in 1967 - the first black athlete in the Southeastern Conference. Yet, there was Charlie Brown playing and starring for Texas Western a full 10 years before all this more publicized activity. I think it's important people remember and know about these things, Brown said. He walks on, quietly moving through the campus and the students of the 1990's - moving gracefully through an area he helped change so much for the better. Born: April 7, 1934, in Longview, Texas. Milestone: First black athlete at UTEP, then Texas Western. Playing career: Played basketball with Air Force in U.S., the Philippines, Mexico and Australia; played at Amarillo Junior College; played three years, Texas Western (1956-59); All-Border Conference pick; 12th all-time leading scorer at UTEP. Education: Atlanta, Texas, High School; bachelor's degree in physical education, Texas Western; master's degree in education administration, San Francisco State; two-year computer degree, University of California-Berkeley. Career: Two years teaching and coaching at Jefferson High; five years teaching in San Francisco Public School System; more than 20 years in San Francisco school system, working on special projects, educating teachers to use computers in the classroom; working with a team of administrators to accredit school systems in California.